38% of students are finding online videos to help with their homework and 27% say they regularly watch videos created by their teachers. Slow and inconsistent Internet is the biggest barrier with using technology at school. Personal access to mobile devices has reached several significant tipping points: 86% of 9-12th, 72% of 6th-8th, and 46% of 3-5th graders are smartphone users now. Almost two-thirds of students want to use digital games for learning in school. Why? Across all grades, students believe that games make difficult concepts easier to understand. 53% say they have received better grades by using technology within learning. 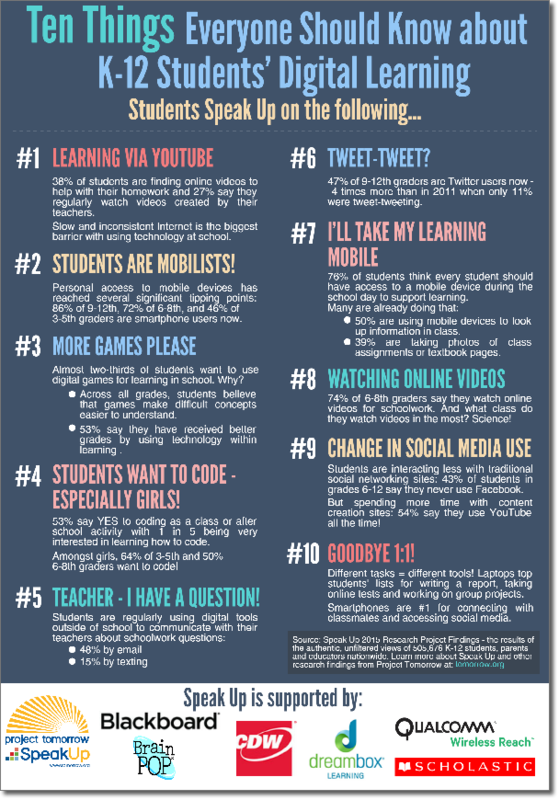 #4 Students Want to Code - Especially Girls! 53% say YES to coding as a class or after school activity, with 1 in 5 being very interested in learning how to code. Amongst girls, 64% of 3-5th and 50% of 6-8th graders want to code! #5 Teacher - I Have a Question! 47% of 9-12th graders are Twitter users now - 4 times more than in 2011 when only 11% were tweet-tweeting. 50% are using mobile devices to look up information in class. 39% are taking photos of class assignments or textbook pages. 74% of 6-8th graders say they watch online videos for schoolwork. And what class so they watch videos in the most? Science! Students are interacting less with traditional social networking sites: 43% of students in grades 6-12 say they never use Facebook. But spending more time with content creation sites: 54% say they use YouTube all the time! Different tasks = different tools! Laptops top students’ lists for writing a report, taking online tests and working on group projects. Smartphones are #1 for connecting with classmates and accessing social media. Source: Speak Up 2015 Research Project for Digital Learning Findings - the results of the authentic, unfiltered views of 505,676 K-12 students, parents and educators nationwide. Learn more about Speak Up and other research findings from Project Tomorrow at tomorrow.org.